Newer devices were not compatible with pushing and pulling directly using VTS. 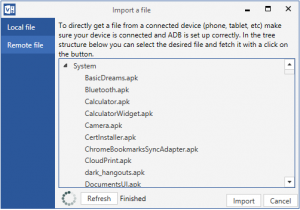 The latest version of VTS solves this problem, and you can once again pull directly from your device via your adb connection, then push straight back once edits have been made. This drastically improves the overall user experience. The Import, Build and Push tasks are now based on scripts, rather than being hardcoded, meaning they can be customised by the user to suit individual needs. To read more about scripts and customisations, click here for an article outlining details on what is possible with these options. The search window now has a global search history, making repeat searches easier. VTS will also now remember the last directory you were searching in. Have you found a public ID reference and would like to know the item this ID is for? 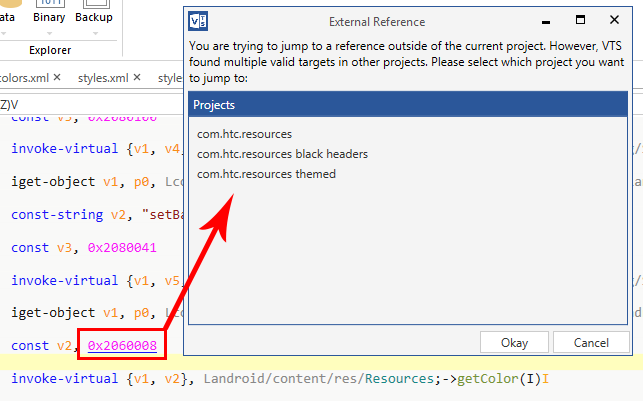 VTS will now allow you to directly jump from this reference to its source in another project within the same solution. This saves a lot of search time, and allows you to ‘connect the dots’ between various binaries. 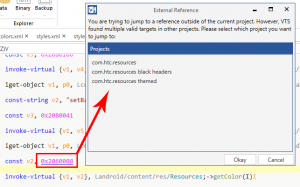 To make this jump between projects, simply hold on CTRL while left clicking on the reference (just like with local references in previous versions). If you happen to have multiple projects in the solution with this jump target, VTS will allow you to choose which one you would like to use. 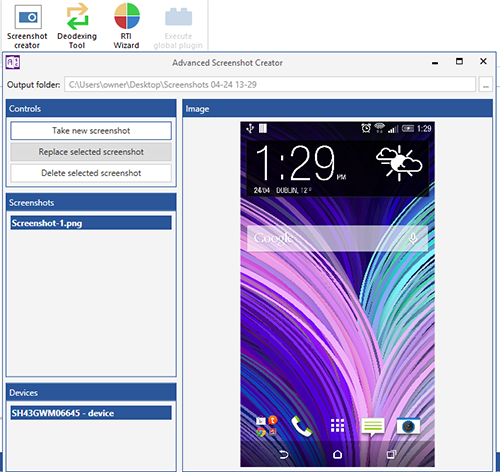 You can now easily take screenshots with a simple click of a button. Images can be viewed instantly and are stored locally. The UI now has a much cleaner, modern interface, with graphical improvements and a more uniform look. Solutions will now load up to 20 times faster, and the Logcat viewer has had performance and memory improvements. These factors combine to make the entire user experience much smoother and faster. VTS 3.x now offers Apktool 2.0 support, meaning that more recent APKs that are now longer compatible with apktool 1.5.2 can be decompiled. This solves a major stumbling block that has arrived with the recent arrival of Sense 6. However, you can still use older APktool versions if desired. The image viewer now allows you to easily switch between different versions of an image found in different drawable folders. No longer do you need to open separate folders for each image, and now you can easily identify the highest resolution image available.